The residents of a posh condo development along the riverfront in Bellevue have a message for its creator: We don't want renters. "They don't care about Bellevue," Cathi Ege warned about possible renters. "Harbor Greene is a wonderful place, the condos there, the riverfront. The people were promised condos, not apartments and I really don't want to see more transient people come here." Ege and her husband Rick live on Van Voast but spoke alongside their neighbors on the riverfront against a proposal that would revamp the Harbor Greene development to include 180 apartment units. Developer Dobbs Ackermann requested a change in his proposal, citing a poor market for condo development, even at a site where condos first went up more than eight years ago. In May, the city's planning and zoning committee rejected the request. 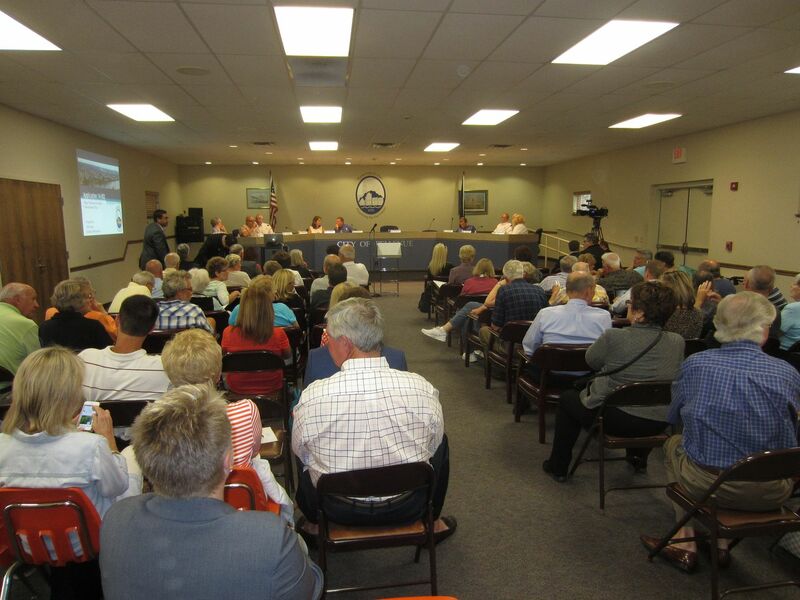 Ackermann was present at a special meeting of Bellevue City County on Thursday and he got an earful from the condo building's tenants and the surrounding community who fiercely oppose any renters coming to town. "The highest and best use for that land in my opinion is condos," said Harbor Greene resident Nelson Rennekamp, a past president of the Northern Kentucky Association of Realtors. "There are two re-sales in Harbor Green in the past six months. One sold in less than sixty days and one sold in less than fourteen days. In my thirty-five years in real estate, from a personal standpoint, I've only been involved in two lawsuits and coincidentally they've been against the same person." Ackermann is being sued by residents of Harbor Greene. The development, first proposed in 2002, has seen many changes since then. By 2004, the first phase went up with thirty condominiums in one building and then three years later, a commercial building north of Fairfield Avenue. But plans for more condos were affected by two issues: the tanking of the economy and real estate market as well as Bellevue's adoption of a strict form based code, a zoning and design guideline that aims to maintain the city's historic setting and feel, even with new construction. Now there is still no market for condos, Ackermann said. He and the city have spent the past few years developing a plan to move forward. 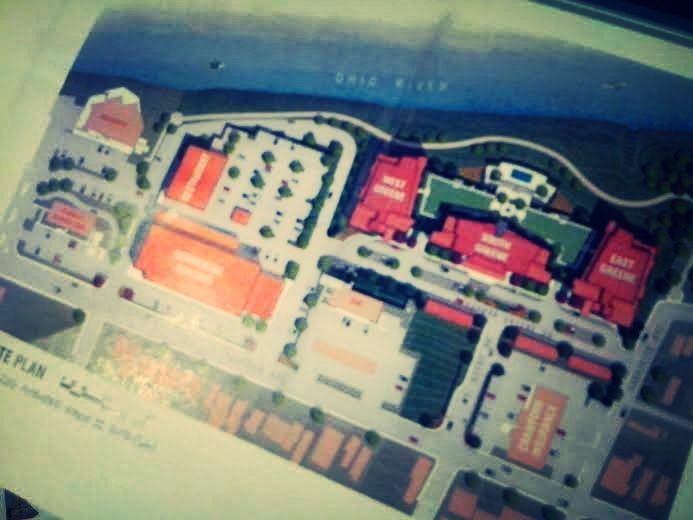 After months of mediation, Ackermann said he and the city agreed to five facts: there would be no more than 180 apartments on the site, a view corridor down Berry Avenue to the Ohio River would be maintained, a design review committee would agree to the plans, a portion of Harbor Greene Drive would more directly connect with Lafayette Avenue, and a building would be placed on Fairfield Avenue at a site previously not immediately included in the development. "We have met the requests and agreements that have been made through mediation," Ackermann said in the crowded chamber of the Callahan Center. "As much as so many people in the room want this to be a public debate, this is not a public debate. This is a matter of looking at agreements we are in with the City of Bellevue and looking at documents that guide how approval should be given and what can and cannot be built." "I find it laughable that this developer has submitted to council that residents of this city should have no say," said Harbor Greene resident Bruce Ross as the crowd laughed and cheered. "The day that council quits listening to residents of this city, it's the day the members of this council will be voted out of office and the day this city starts to decline." And then the opponents of the proposed apartments began to share their formal and informal real estate expertise on why condos are better than apartments in spite of the recent trend toward rentals. Ross cited Forbes and Newsweek articles that indicate large apartment complexes are in decline. "We don't want that to happen in Bellevue. We're preparing for the future. It's right on target. It doesn't include large apartment complexes," he said. "I learned never to discount the importance of demographics and supply and demand," said Harbor Greene resident Marty Betagole. "There are hundreds of rental units under construction in Downtown Cincinnati and Newport and Over-the-Rhine. My informal survey of millenials, who I think would be the target market for this, all prefer to live in Downtown and OTR. I think in Bellevue you may find a higher vacancy rate. They would have to lower the price." Betagole said of three units currently listed on the MLS at roughly $500,000 in condo towers along the riverfront, Harbor Greene's unit was 43% less expensive in association fees compared to the Ascent in Covington and Southshore in Newport. "Harbor Greene is a unique kind of property." Residents also expressed concern about having to share their pool with apartment renters, another subject of the lawsuit. Numbers provided to The River City News in May by Bellevue City Administrator Keith Spoelker show that the city would gain financially from the apartment development. The original plan would have brought in over $6 million for the city over the life of the 30-year bonds used at the beginning of construction. With the current situation of just one completed condo building, the city would bring in substantially less at $1.7 million. The apartment proposal rejected Thursday would have been worth $4.2 million to the city according to Spoelker's forecast. If the city waits an estimated ten years for a full condo market recovery, the city would bring in $1.9 million. Spoelker is also concerned that the developer could end up suing the city. Because the city's regular attorney represents the developer in other cases, Bellevue has hired outside counsel during this process at $250 an hour. Litigation could drive a legal bill up into the tens or even hundreds of thousands, Spoelker said. Ackermann said opponents of the deal are not sharing facts. "In regards to aspects of the market place, it's interesting to hear people claiming loss of equity in property while others are saying prices are going up," he said. "We don't see a lot of facts in anything being produced nor do they really matter based on the agreement we are in." The meeting was adjourned without any action taking place.